Over the past couple of years, HTC has rapidly built up an enviable reputation (and bank balance) in the smartphone space with a succession of feature-rich, smartly designed, and innovative handsets. The HD2 introduced us to the 4.3-inch form factor, the EVO 4G ushered in the era of 720p video recording, and the Legend wrapped itself inside a never-before-seen aluminum unibody enclosure. Today, the company's Android assembly line is turning out yet another groundbreaking device, though this one's closer in size to the Athena than the Aria. Yes, we're talking about the 7-inch Flyer, the most unique of this year's Android tablet offerings, opting for a 1.5GHz Qualcomm Snapdragon processor, a sturdy aluminum construction that doesn't even try to compete in the race for extreme thinness, and a Magic Pen to make you forget it's running Gingerbread and not Honeycomb (yet). Also set for release under the EVO View 4G moniker on Sprint in the US, this tablet is the sum of a set of bold choices on the part of HTC. To see how well those decisions have come off, click past the break for our full review. How would you rate the Flyer? Thinking back to the first time we saw the Flyer in person -- at a pre-MWC briefing back in February -- we have to say this tablet didn't make the happiest of first impressions. It's a weighty old thing (420 grams / 14.8 ounces) that looked thick even before we laid eyes on the subsequent iPad 2 and Samsung Galaxy Tab super-slimsters. In fact, we had a 7-inch Galaxy Tab on hand and the Flyer was instantly humbled by the slicker, lighter, and far more refined slate from Samsung. HTC's choice of a tri-color palette also dashes any chances of the Flyer appearing sophisticated. The white plastic elements at the top and bottom don't really blend in well with either the grey aluminum shell or the black bezel around the screen. Adding insult to injury, the lower one of those plastic inserts actually protrudes from the body, giving an already chunky tablet some extra junk in the trunk. You'd hope, after such an inauspicious start, that form has been sacrificed at the altar of function here and we can happily report that to be the case. Though we found the Flyer's weight unwieldy at first, we adapted to it over time and would now actually describe it as reassuring. A big portion of that heft comes from the tablet's unibody metal enclosure -- one uninterrupted chunk of aluminum wraps around most of the Flyer's rear and sides, protecting it from bumps and scrapes and lending it an excellent feel of rigidity and stoutness. If we had a prize for ruggedness among tablets not specifically designed for rough terrain, the Flyer would win it with, ahem, flying colors. That's not mere rhetoric, either -- we were clumsy enough to drop our review unit onto a cement floor and you'll spot the resulting scuffs on its back in our hands-on gallery. The Flyer's curved sides are classic HTC and help make it easy and comfortable to handle. You might end up with stronger forearms from the effort of holding it up, but you won't be causing yourself injury from awkward or annoying ergonomics. Taking it out for a day-long stroll around London, we found this slate a joy to tote around in one hand or -- as unbelievable as it may sound -- stashing it in a pocket. Contrary to any of the 8.9-,9.7- or 10.1-inch tablets that are currently staking a claim as the mainstream's favorite form factor, the 7-inch Flyer is truly portable enough to carry around without either a dedicated carrying case or some other pouch to slot it into. Even so, HTC has decided to bundle a sparkly white case in the retail package, which is of an above-average quality, fits snugly around the tablet, and provides an all-important holder for the Magic Pen accessory. Some might (rightly) argue that they'd rather have a cheaper tablet than more goodies in the box, but the Flyer's case provides an extra layer of protection and a very neat way to transport it together with the stylus. The flap is kept closed by nature's own awesome technology: magnets. It's ironic to think that this fatty of the tablet world would offer more convenience on the move than all the supermodel skinny slates, but we've found ourselves slowly falling in love with the Flyer's screen size. 7 inches feels like our perfect bowl of porridge -- neither too small for satisfactory web browsing nor too large to use discreetly. In particular, thumb-typing on the software keyboard in portrait orientation is an absolute dream. This shouldn't come as a surprise if you've read our coverage of Samsung's original Galaxy Tab, as we also praised that 7-incher for having the ideal size for thumbing your way through missives. An additional benefit in HTC's case is that our concern about its Android onscreen keyboard being a little cramped is entirely dispelled by the enlargement to the Flyer's proportions. It is now an unqualified delight to use and our typing speed on this tablet was matched only by the device's responsiveness and preparedness for more input. An additional nod of approval should be directed at HTC's prediction algorithm, which exhibited more intelligence than we're used to seeing and almost always knew the word we were trying to articulate before we were done writing it out. When strapped with a 3G radio (compatible with T-Mobile in the USA), the Flyer provides a very intriguing potential usage scenario: it can actually serve as your smartphone replacement. Admittedly, the "phone" part of that equation can't be readily substituted, but hear us out. Our daily smartphone use revolves almost entirely around having a data connection and most of our communications are done via web services such as Google Talk, IRC, Twitter, and simple old email. Hell, the only time we remind ourselves we're still using a phone is when we send the occasional SMS, but the Flyer has a fully fledged messaging app to deal with those instances. We tried living with the Flyer in the place of a smartphone for a couple of days and, quite frankly, found little downside to it. We wouldn't yet argue abandoning the more compact and versatile smaller handsets, but we definitely feel the 7-inch form factor has more to offer than merely a stopgap device between a phone and a laptop -- circumstances exist where it will be able to usurp those stalwart devices' roles entirely, even if only for limited periods of time. HTC won't confirm this for us, but we're almost certain we're looking at another Super LCD on the Flyer. Color fidelity at oblique angles is too good for this to be just some run-of-the-mill TFT display. We enjoyed our use of the Flyer immensely, it has plenty of brightness (which never overwhelms the picture), vibrancy, and sharpness to go around. Going outdoors was an especial highlight, as the Flyer dialed things up and did a superb job of overcoming natural light to provide us with great usability. Web browsing, movie playback, Angry Birds, nothing was hampered unduly by the influence of the sun. We also haven't been able to spot flaws of any sort, whether they be an inconsistent backlight, improper color reproduction, or touchscreen sensitivity deficits. It's just a very, very good screen. If you look closely enough, you'll spot a grid of dots uniformly applied to the entire display, which we're guessing is there as part of the N-Trig stylus recognition hardware setup. You'll only spot that array with the tablet turned off, though, as it becomes imperceptible once the lights come on. You get 1024 x 600 pixels to play around with, a reasonable number given the Flyer's size, though it doesn't move things forward from the Samsung Galaxy Tab of yesteryear. Really, really impressive. We unplugged the Flyer at 9AM one morning, spent the full day throwing everything we could think of at it -- push updates from Gmail, Twitter, Facebook, and a news feed of Engadget and BBC updates, plus extensive camera testing, web browsing, music playback, and a solid hour of Angry Birds Rio gameplay -- and by 9PM in the evening we still had over 20 percent of juice left. For a 3G device whose cellular connection was regularly put to use, that was a spectacular performance. 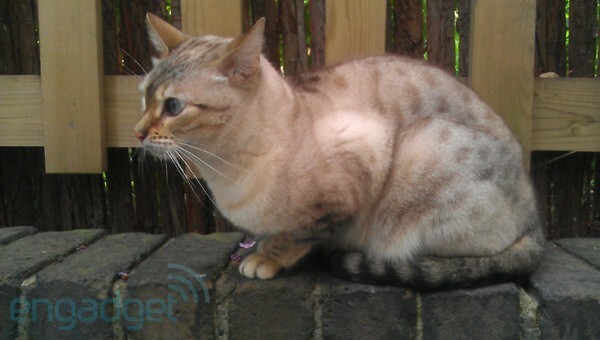 Looking at Android's battery-tracking graph, the camera was the main culprit for eating into the Flyer's energy reserves. It looks to be one of the few tasks that require the tablet to run at full throttle, and the briskness with which it depleted the battery illustrates how taxing that 1.4GHz speed is. All the same, we managed to get 12 action-packed hours out of the Flyer's cell and have no doubt it'll last for two days' worth of regular use. HTC also throws in an optional sleep mode, which shuts down wireless radios when the tablet's locked. You can set specific time periods for when this is on (e.g. 11PM to 6AM) and the tradeoff for extended battery life is obviously that you won't receive any push alerts without turning the tablet on. Of course, if you're actually sleeping during that period, that's no downer at all. Naturally, this is in addition to the company's familiar power saver feature that tweaks screen brightness and other settings when a given threshold of battery reserves is passed. Stereo speakers remain something of a novelty on mobile devices, but alas, the pair that reside on the Flyer's back aren't of the greatest quality. They produce a tinny, unsatisfying sound, which is highlighted when you plug in a pair of headphones and get to hear the real richness of audio coming out of the tablet. HTC's inclusion of SRS sound enhancement is really good stuff, providing a wider sound stage and bringing out more detail in whatever we were listening to, but you'll definitely need a set of cans to appreciate it. While you're busy connecting those headphones, you might notice something curious about the power button sat right alongside the 3.5mm output -- it has the Flyer's status LED integrated inside it. That's right, the power button itself emanates a dot of light when the tablet wants to notify you of something. Very slick. Additionally, the capacitive Android keys are made available in both landscape and portrait mode, with a set of them built into the bottom and left-hand bezel of the Flyer. When not in use, they become nearly invisible, but they come to life just as soon as you re-orient the slate to match them -- notably, the Flyer can only do two orientations, which match up to its Android buttonry, and it won't rotate if you try to hold it "upside down." 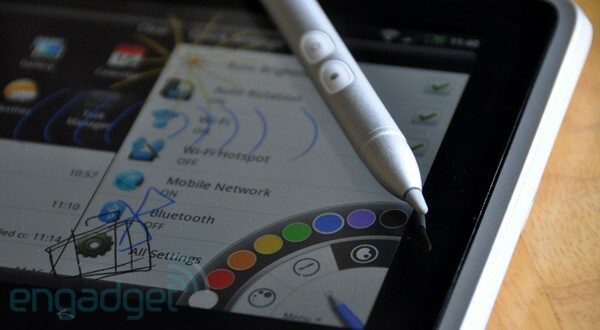 You get Home, Menu and Back keys for your digits and a dedicated stylus menu key that can only be activated with the Magic Pen. We like this distinction as it precludes any accidental taps into pen functionality when you're without said scribbler. 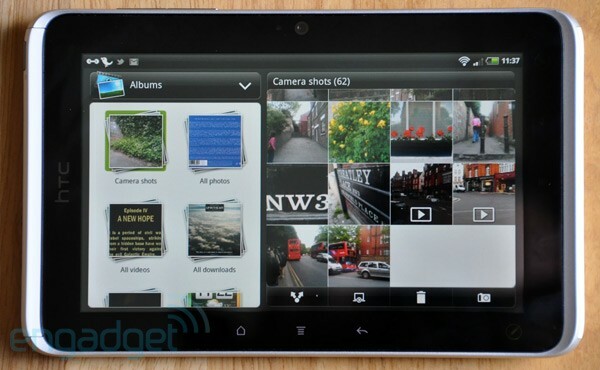 Bad news, folks -- the trend of us finding unsatisfying cameras on tablets continues. The Flyer's 5 megapixel rear imager struggled mightily during our testing in spite of being provided with nearly perfect lighting to do its work in. Blotchy, blurry, and simply bad, its output was consistently below what we might hope to see produced by a modern mobile device. 5 megapixels are clearly far too many for this sensor to fill and the only time we can condone taking pictures with the Flyer is when you know you won't be showing them in a resolution greater than, say, half a megapixel. That's close to the size of the pics in our sample gallery and is, regrettably, the upper limit of what you'll get away with. The front-facing 1.3 megapixel camera doesn't do much better, but good lighting will help it produce acceptable results and its quality will be sufficient for video calls or the occasional messing about with the included Snapbooth application (results from which can be seen below). In terms of software, you're looking at HTC's typical customized interface, which could do with a few more adjustment options, but then if the picture-capturing hardware isn't up to much, what does the software really matter? A saving grace, perhaps, is HTC's inclusion of a number of filters and effects that might let you use the Flyer's camera to create funkier, less detail-conscious concoctions. It's a compromise, but we reckon it's better than nothing. Video didn't fare too much better, as is to be expected given the content for it is provided from the same image sensor. Softness is apparent throughout our recordings, making a mockery of the claim that the Flyer records 720p video -- it feels more like something a quarter of the resolution that's been scaled up... poorly. As if that's insufficiently frown-worthy, sound recording is also poor, producing a tinny, inarticulate output that fails to convey much of any atmosphere. On the plus side, that functions as a sort of wind noise neutralizer, since the Flyer's failure to pick up much of any aural detail also drowns out the wind. On a less frivolous note, we do very much like the way the Flyer's camcorder keeps up with motion. If the quality of the actual results wasn't so poor, we might even commend it for exhibiting so little ghosting or rolling shutter effect. If you weren't already struck by the thought that the Flyer looks an awful lot like a scaled-up Desire HD, booting into its familiar Sense UI will be sure to give you that sensation. 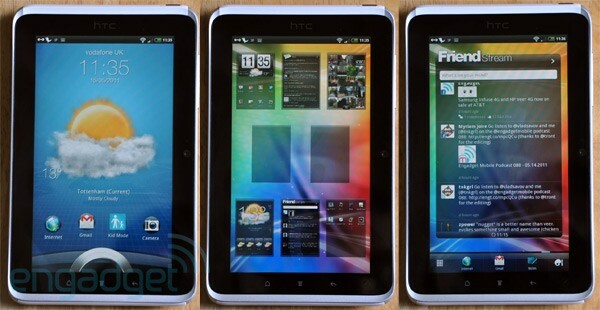 HTC opted to build the Flyer's software atop Android 2.3, the latest in Google's smartphone stable, and not the tablet-oriented Android 3.0. In conversations with the company, we've heard that justified as a matter of expedience, as HTC didn't have enough time with the Honeycomb code to integrate its Sense UI paradigm and had to revert to the next best thing. The fallout from this decision is that using the Flyer is an inevitably similar experience to using an HTC Gingerbread phone, though we've come to find that's not a particularly bad thing at all. Setting aside the improvements just introduced by Google in Android 3.1, we've been of the view that Honeycomb remains unpolished and in need of extra work to optimize responsiveness and better exploit the added real estate afforded by tablets relative to smartphones. Those are things that will surely come over time, but until they do, Android slate buyers are left to answer the question of what they should do in the interim. Motorola will tell you to run the standard Honeycomb and like it, Samsung will tell you that TouchWiz 4.0 will make everything better, and HTC will urge you to use Gingerbread until it can cook up the right Honeycomb recipe. We can't yet speak authoritatively on how Samsung's skinned Honeycomb tastes, but from our experience with the Flyer, we'd argue HTC's implementation is preferable to stock Android 3.0 installations. It's faster to respond, feels more refined, and though it has significant weaknesses of its own, the unfortunately immature Honeycomb doesn't offer a stark enough contrast to highlight them as it should. Lest you find all this poor consolation for HTC failing to ship the Flyer with the latest firmware on board, an update to Android 3.x has been promised for this summer, so this tablet won't be hanging out in smartphone software territory for an excessive period of time. The really important thing to say is that the user experience on the Flyer already works, and very well at that. It features version 3.0 of Sense, which brings an enhanced lockscreen that will display a lushly animated weather update up top and a set of four shortcuts at the bottom. The latter allow instant access to your favored apps -- you just drag an icon into HTC's so-called activation circle and then a couple more animations spin up and spirit you away into whatever app you selected. We keep wondering why more sophisticated lockscreens like this aren't already standard fare in touchscreen devices and HTC's implementation makes us ponder that question all the more. It's executed with precision and makes rapid use of the tablet a cinch. 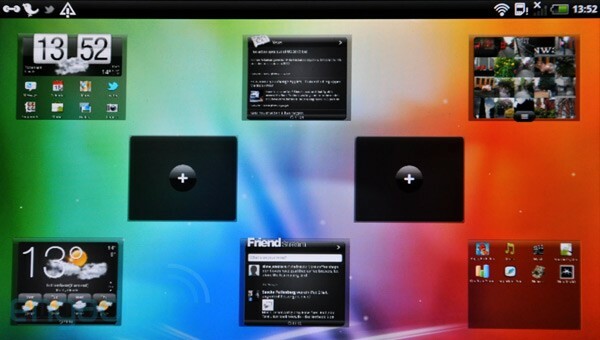 Once you unlock your way past the greeting screen, eight homescreens literally spin into view. In spite of the increased 1024 x 600 resolution, HTC is still offering you a grid of sixteen discrete slots per homescreen, which can be occupied by apps, folders, shortcuts, or widgets. There's almost nothing here that you won't find on HTC's Android Gingerbread phones, which isn't a terrible thing in and of itself, but more widgets and programs optimized for the Flyer's size would have been appreciated. As it stands, it just provides an extremely usable, mostly responsive user experience that some will find all too familiar. Animated and 3D graphics are really emphasized in HTC's latest UI. You're still gazing at the same old clock-and-weather widget as the one you saw on the Hero nearly two years ago, but now when you slide away from it, its homescreen turns away in a manner imitating a carousel and faux 3D elements are exposed in the "side" of that widget, lending it a bit more realism and luster. We don't know how to feel about HTC making the Flyer's interface quite so graphically intensive. On the one hand, it adds an extra layer of polish that makes use of the tablet feel modern and snazzy, but on the other, those flourishes do consume system resources without adding anything in terms of function. Worst of all, in spite of the Flyer being highly responsive in most circumstances, we found lag and stuttery animations creeping in on us after some extended use, which we're inclined to blame on the extra veneer of prettiness. We most often found the tablet slower than ideal when we were unlocking into an app, as it had to animate both the motion of that app icon and pulsating animation around the activation ring. In terms of applications on the device, we absolutely loved the split views HTC has introduced in the browser, calendar and gallery apps. When browsing the web, you can have a little bar up top with previews of all the tabs you have open. This is extremely handy when you want to either reference multiple pages or instruct the browser to go load a couple of items while you're reading a third. The Flyer's screen size again shows its advantage here as the preview bar feels just the right size to inform without obscuring too much. Similarly, the gallery app will let you browse one gallery on the right side of the screen while showing you an overview of all available albums on the left, making it easy to skip around in rapid fashion. The calendar does the same thing, providing a monthly, weekly or daily overview on the left and a single day's agenda on the right. It's simply excellent stuff. Oddly, both the calendar and gallery work only in landscape mode, whereas we'd surmise it'd be easy to stack the two elements that sit side by side in landscape atop one another in portrait mode. Unfortunately, that just about exhausts the list of software that truly exploits the Flyer's 7-inch size and 1024 x 600 resolution. For the rest, you're stuck with expanded versions of apps designed for phones. Again, that's not a horrible situation to be in, as Gmail looks gorgeous while operating with the added real estate, but it's not the tablet-optimized, slicker version that Honeycomb users are enjoying. Google Talk also doesn't benefit from the video and voice chat implementation that's available in Android 2.3.4 and 3.0, leaving you having to download an app from the Market to put that front-facing camera to the use it was made to fulfill. Perhaps the most aggravating issue -- because it feels like a choice rather than any sort of technical limitation -- is that HTC's widgets suffer from a mass of wasted space. There's a persistent dock at the bottom that you can customize with shortcuts, which is fine, but then its space usurpation is augmented by making widgets fit within windows inside the tablet, allowing them insufficient room to be informative at a glance and forcing unnecessary scrolling from the user to see more content. That's true whether you're talking of the Friend Stream, Messages, Music, My Shelf (for ebooks, powered by Kobo), News, or Weather widget. Nothing is even close to employing the full screen without opening the app itself. Moreover, when you receive a message or play back music, the lockscreen is dominated by big and gaudy UI elements that also play fast and loose with screen real estate that could be better utilized. Overall, there's a definite sense of inefficiency to what HTC has done here. Another 3D interface awaits eager movie lovers once they step into HTC Watch. Sadly, as attractive and quick as the interface to this movie-renting and -buying app may be, at present it's only dedicated to showing off a set of eight trailers. 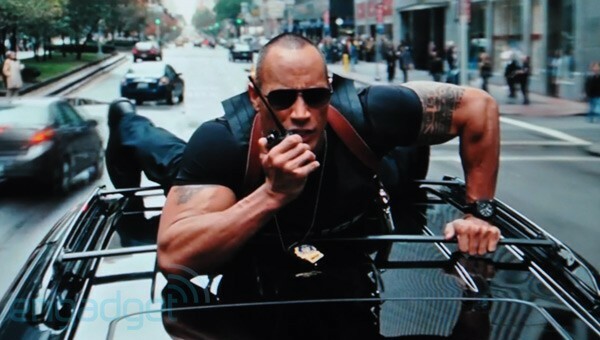 We're told we're on the very precipice of the service going live and permitting Flyer owners to buy and enjoy movies across their Watch-compatible devices (the Sensation being another one announced to support it), but at the moment there's little we can comment about. The eventual system will offer films on a progressive download basis, which you can consider just another form of streaming. You just have to let the Flyer buffer up a bit of content at first and then you can simultaneously watch and download your movie. We're sure that's slick stuff, but disappointed not to be able to test it -- particularly since the Flyer is already on sale. What we can say is that the trailers we checked out on the Flyer looked spectacular. The resolution on the screen is plenty dense enough, but it's really the quality of that 7-inch display that kept us mesmerized by what were teasers to some pretty appalling flicks. Top marks for hardware, but HTC needs to get its house in order and make this thing live already. Update: And just as we've said all that, HTC has turned Watch loose in the UK. Pricing varies between £7.99 ($12.94) and £9.99 ($16.20) for movie purchases, and £2.49 ($4) and £3.49 ($5.65) for movie rentals, depending on the film's age and popularity. At present, some flicks are only available to rent and others are only available to buy, but we expect that's just a temporary situation while HTC gets its store built out properly. There are also TV show episodes up for consumption, with 60-minute Gossip Girl blasts costing you £1.49 ($2.40) to own. As usual, we've provided currency conversions as simple guides to pricing, you should expect HTC to have separate deals arranged for content distribution in the US, whose cost will likely differ from that in the UK. Speaking of live things, we were also bummed not to be able to test out the OnLive cloud gaming service. It's only available in the US for now, whereas we reviewed the Flyer in the UK and there's nary a trace of it on the tablet. The US product (and the UK one once OnLive crosses the Atlantic) will benefit from an app that jacks it into the OnLive network and gets you playing such things as Assassin's Creed: Brotherhood, Just Cause 2, Borderlands, and -- eventually -- Duke Nukem Forever! You can rest assured we'll be doing a separate feature on how this touchscreen device handles the control schemes of these games in due course. 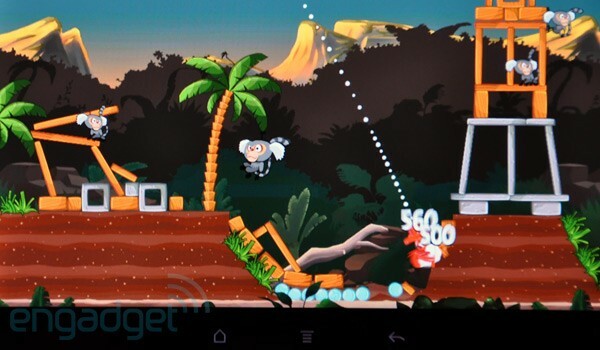 As to playing Android Market games on the Flyer, we couldn't find a single one that caused it any performance issues, though we admittedly spent most of our time shaking monkeys out of trees in Angry Birds Rio. Still, for the speed junkies among you, we made sure to run a batch of benchmarks to check how quickly this tablet's heart beats. The usual proviso should be heeded here: graphical tests such as those carried out in Quadrant run at the device's default resolution, so the Flyer's 1024 x 600 panel will be at an immediate disadvantage to smartphones running more modest pixel counts. Our average scores were as follows: Quadrant: 2,050, Linpack: 55 MFLOPS, Neocore: 51fps, Nenamark: 36fps. Basically, it performs exactly in line with what you'd expect from a machine employing a 1.5GHz processor, Adreno 205 graphics, and 1GB of RAM. And now we come to the Flyer's headline differentiator: the Magic Pen. A lot of work has clearly gone into making this stylus a coherently integrated and value-adding element of the Flyer's retail proposition. We're inclined to believe the major reason HTC is bundling a case in with this otherwise sturdy tablet was so that there could be a place to stash the Magic Pen, which in itself is styled very much in keeping with the Flyer's aesthetic and is also made of aluminum. The Flyer's Notes app is almost entirely dedicated to the Pen and serves to show both its greatest strength and weakness. The strength is the sheer variety of useful things you can do with the app, the weakness is that it's the only one that truly harnesses the stylus to its full potential. Admittedly, the Kid Mode app has a rudimentary painting canvas and the Kobo-powered ebook reader lets you annotate books on the fly, but the fact remains that the utility of the Magic Pen drops off steeply once you step outside of Notes. You'll still be able to draw over anything else you see on the Flyer's screen, though you'll need to capture a screenshot (HTC calls this a Scribble) of the page before applying your nib to it. Inside the Notes app, you're able to annotate, highlight, and doodle to your heart's content. There's also an audio recording function that intelligently associates typed or written notes with the time in a recording, essentially creating automatic timestamps. Sadly, this doesn't work too brilliantly as it requires a pretty sizable gap between note-taking in order to insert a new timestamp, which may make it less useful if you're constantly writing away during a lecture. Use in academic environs may indeed be the Flyer's big target market, so a discussion is merited of how well it works as a receptacle of handwritten notes. We put in a few sincere attempts at jotting things down with the stylus and were met by a pair of issues: firstly, if your hand makes contact with the screen before the Magic Pen, the Flyer takes that as indicative of your intention to type and brings up the onscreen keyboard, and secondly, refined input with the pen is very hard indeed. We'll readily admit we're not as practiced at using pens as we are with keyboards, but writing on the Flyer was significantly harder than using a real ink diffuser. Our letters were about twice the size as on real paper and approximately five times as ugly. We encountered similar difficulty when trying to accurately plot a course on a Scribble of Google Maps -- it was just too hard to stay within the lines. So, the Magic Pen isn't all that hot on intricate detail, but if you decide to use it as a fast and loose accessory to the rest of your work on the Flyer, you'll likely be very well rewarded. It's weirdly addictive to add doodles and annotations, whether to webpages or images captured with the tablet's camera, and we found ourselves spending lengthy sessions trying out the pressure sensitivity (not a wide range by any means), different nub size and shape options, and color variations. On the whole, input recognition works very well and we recognize a bunch of uses that it can be put to, both practical and farcial, but HTC will need to step up its game and introduce more in the way of pen-friendly software. One note-taking app will not bring the stylus revolution about by itself. We came, we saw, we doodled. 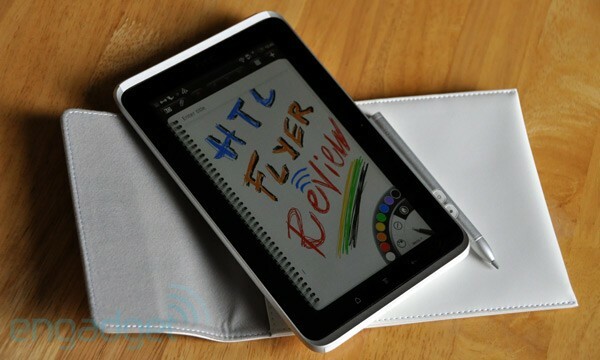 The HTC Flyer is the result of a well thought-out and executed plan by HTC. It is truly differentiated from the Android tablet pack with its robust aluminum construction, Magic Pen inclusion, and more responsive interface, and aside from a few imperfections and a general immaturity of tablet-specific software, it's as competently designed a tablet as we've yet seen. Its 7-inch display is a beauty to behold and, though it may be encased in a somewhat bulky body, its size strikes the right balance between portability and utility. The real issue holding the Flyer from a successful launch, in our opinion, will be its pricing. We got to grips with the 32GB, 3G-equipped variant which retails at £600 in the UK, or £21 more than the similarly outfitted iPad 2. The latter is thinner, faster, and bigger, which in most people's eyes will make the choice between the two a no-brainer in favor of the Apple device. What's even more perplexing is that the 16GB, WiFi-only Flyer will cost £480, or exactly the same as the 32GB WiFi-only iPad 2. How HTC hopes to convince buyers to spend more for less, we're not really sure. Setting aside the economics, we truly enjoyed our time with the Flyer and will regret to see it depart our testing nest. 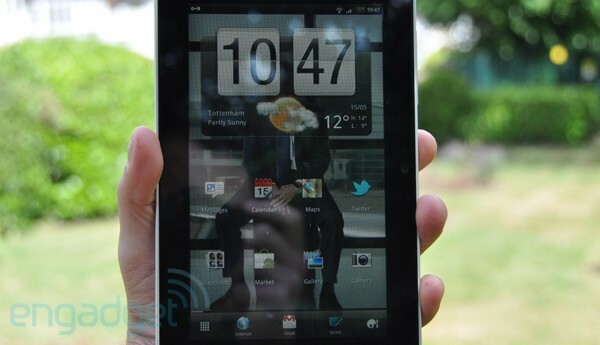 It's a fine tablet pointing to a bright future for HTC's newly expanded mobile device range. We'd probably advise waiting until the next generation to see prices reduced to saner levels and refinements made on the software front, but that's true of any device ever built. The Flyer will find a market for itself, and there'll be a group of very satisfied users for whom it'll provide a unique blend of functionality. You'll just have to carefully consider your mobile computing needs and how well they mesh with what HTC has to offer.